Hi there! I will tell you today about the letter Frequency-dependent tidal dissipation in a viscoelastic Saturnian core and expansion of Mimas’ semi-major axis, by Daigo Shoji and Hauke Hussmann, both working at the DLR in Berlin, Germany. This paper has recently been published in Astronomy and Astrophysics. Do I need to introduce Saturn? Saturn is the sixth planet of the Solar System by its distance to the Sun, and the second by its size. It orbits the Sun at a mean distance of 1.5 billions of km, in 29.4 years. It has more than 200 satellites, which comprises small moons embedded in the rings, mid-sized icy satellites, a large one, i.e. Titan, and very far small moons which are probably trapped objects. Which means that the other bodies are expected to have formed while orbiting around Saturn, or formed from the same protoplanetary disk. 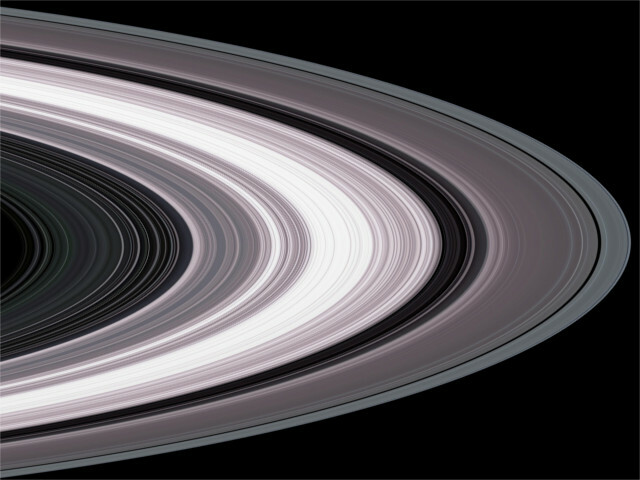 Saturn is particularly known for its large rings, which can be observed from the Earth with almost any telescope. Moreover this planet is on average less dense than the water, which is due to a large atmosphere enshrouding a core. The total radius of Saturn is about 60,000 km, which actually corresponds to a pressure of 1 bar in the atmosphere, while the radius of the core is about 13,000 km. The paper I present today is particularly focused on the core. The spacecraft Cassini orbits Saturn since 2004, and has given us invaluable information on the planet, the rings, and the satellites. 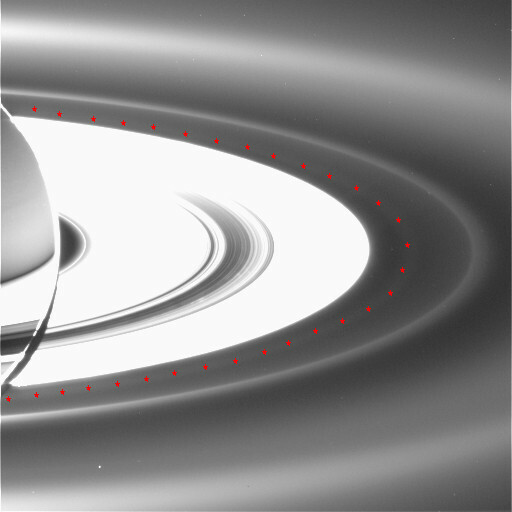 Some of these information pushed the French planetologist Sébastien Charnoz, assisted by French and US colleagues, to propose a new model of formation of the satellites from the rings: this model states that instead of having formed with Saturn, the rings are pretty recent, i.e. less than 1 Gyr, and are due to the disintegration of an impactor. Once the debris rearranged as a disk, reaccretion of material would have created the satellites, which would then have migrated outward, because of the tidal interaction with the planet… This means that it is crucial to understand the tidal interaction. I have already discussed of tides in this blog. Basically: when you are a satellite (you dream of that, don’t you?) orbiting Saturn, you are massive enough (sorry) to alter the shape of the planet, and raise a bulge which would almost be aligned with you… Almost because while the material constituting the planet responds, you have moved, but actually the bulge is in advance because the planet rotates faster than you orbit around it (you still follow me?). As a consequence, you generate a torque which tends to slow down the spin of the planet, and this is compensated by an outward migration of the satellite (of you, since you are supposed to be the satellite). This compensation comes from the conservation of the angular momentum. You can imagine that the planet also raises a tidal bulge on the satellite, but this does not deal with our paper. So, not today. A consequence of tides is the secular migration of the planetary satellites. Lunar Laser Ranging measurements have detected an outward migration of the Moon at a rate of 3 cm/y. 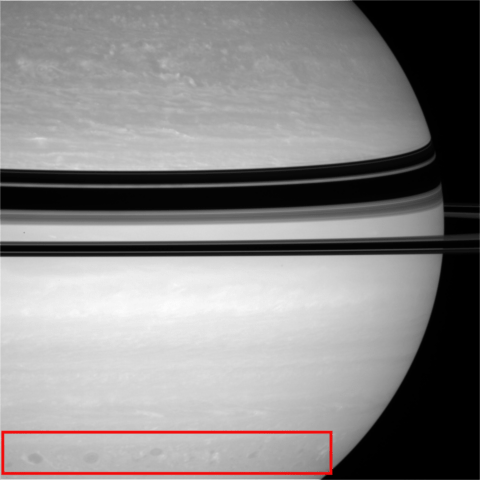 It is not that easy to measure the migration of the satellites of Saturn. An initial estimation, based on the pre-Cassini assumption that the satellites were as old as the Solar System, considered that the satellite Mimas would have at the most migrated from the synchronous orbit to its present one, in 4.5 Gyr. The relevant quantity is the dissipation function Q, and this condition would have meant Q>18,000, in neglecting dissipation in Mimas. Recent measurements based on Cassini observations suggest Q ≈ 2,600, which would be another invalidation of the assumption of primordial satellites. To make things a little more technical: we are interested in the way the material responds to an external, gravitational sollicitation. This sollicitation is quasi-periodic, i.e. it can be expressed as a sum of periodic, sinusoidal terms. With each of these terms is associated a frequency, on which the response of the material depends. This affects the quantity k2/Q, k2 being a Love number and Q the dissipation function I have just presented. Splitting these two quantities is sometimes useless, since they appear as this ratio in the equations ruling the orbital evolution of the satellites. By solid body, I mean a body with some elasticity. Its shape can be altered, but not that much. An elastic response would not dissipate any energy, while a viscoelastic one would, and would be responsible for the migration of the orbits of the satellites. It was long considered that the tidal dissipation did not depend on the excitation frequency, which is physically irrelevant and could lead to non-physical conclusions, e.g. the belief in a stable super-synchronous rotation for planetary satellites. We now consider that the response of the material is pretty elastic for slow excitations, and viscoelastic for rapid ones. If you do not shake the material too much, then you have a chance to not alter it. If you are brutal, then forget it. For that, a pretty simple tidal model rendering this behavior is the Maxwell model, based on one parameter which is the Maxwell time. It is defined as the ratio between the viscosity and the rigidity of the material, and it somehow represents the limit between the elastic and the viscoelastic responses. A refining model for icy satellites is the Andrade model, which considers a higher dissipation at high frequencies. If the planet is a ball of gas, a fortiori a fluid, then the behavior is different, actually much more complicated. You should consider Coriolis forces in the gas, turbulent behaviors, which can be highly non-linear. A recent model has been presented by Jim Fuller, in which he considers the possibility of resonant interactions between the fluid and the satellites, which would result in a high dissipation at the exact orbital frequency of the satellite, and the resonant condition would induce that this high dissipation would survive the migration of the satellite. You can see here an explanation of this phenomenon, drawn by James T. Keane. This paper aims at checking whether a dissipation of the planet, which would be essentially viscoelastic, could be consistent with the recent measurements of tides. 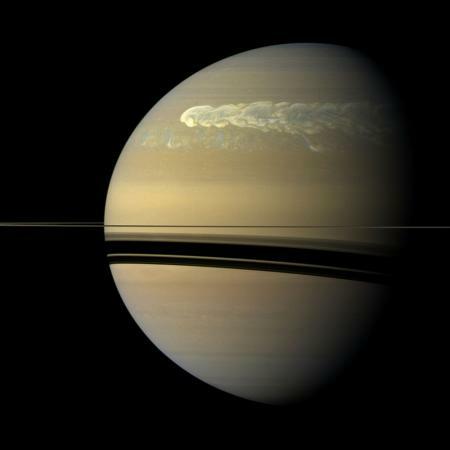 For that, the authors modeled Saturn as an end-member, in neglecting every dissipation in the atmosphere. They considered different plausible numbers for the viscosity and rigidity in the core Saturn, in assuming it has no internal fluid layer, and numerically integrated the migration of Mimas, the variation of its orbital frequency in the expression of tides being taken into account. And the result is that the viscosity should be of the order of 1013-1014 Pa.s. Smaller and higher numbers would be inconsistent with the measured dissipation. 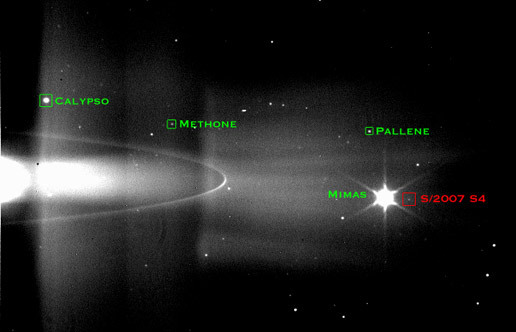 Moreover, some of these viscosities are found to be consistent with the assumption of a primordial Mimas, i.e. with an inward migration from the synchronous orbit in 4.5 Gyr. This letter probably presents a preliminary study, the whole study requiring to consider additional effects, like the pull of the rings, the influence of the atmosphere, and the mean-motion resonances between the satellites (see this post), which themselves alter the rate of migration. And this is why this letter does not invalidate Charnoz’s model of formation, nor Fuller’s tides, but just says that other explanations are possible. The paper, made freely available by the authors on arXiv, thanks to them for sharing! I hope you liked it! Please do not forget to comment. You can also subscribe to the RSS feed, and follow me on Twitter.